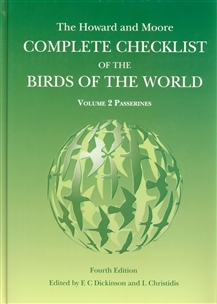 The Howard and Moore Complete Checklist of the Birds of the World, 4th Edition, has been revised extensively and has additional new features. The references and appendices have been moved to an accompanying CD-ROM. This edition has been split over two volumes, with volume 1 listing the non-passerines and volume 2 listing the passerines. "Creating this edition has been challenging and rewarding. In spite of the influence of the Internet we are committed long term to periodic print editions because they provide a permanent citable record. Updates however will be published electronically (in a form approved by the International Commission for Zoological Nomenclature). The challenge has been to cope with the flood of molecular studies that seek to better inform us on the evolutionary relationships of birds. In many cases ideas about a particular group have changed several times within the last 15 years and techniques continue to be refined so that changes will continue although perhaps more slowly now. The rewards have come from those we have worked with both within the team and within the Advisory Committee, and other contributors. Where 10 or 15 years ago there were less than 150 recognised families of birds we now treat 234 of which 134 are passerine family (for which the increase is in the order of 70%). Between the two volumes we now treat 10 135 species of birds and 2 340 genera. We have provided a number of important innovative features adding to those which were acclaimed after the 3rd edition appeared in 2003. These include (1) information on the type species of every genus – because that species is a critical piece in any revision of relationships. If it moves from one group to another that genus name, which moves with it, may relate to a largely different group of species or that name may sink into synonymy. Every author writing up, and indeed planning, molecular studies should be aware of the extra importance of such species; (2) signals explaining which names are variable (i.e. names for which the last part, the suffix, will vary with the gender of the generic name); (3) reflected ideas of other writers in respect of subspecies groups (which we number in the left-hand margin). The range statements have been revised almost throughout and are now both more helpful and linked to a Gazetteer (in the accompanying CD). The 8 000 footnotes (double the number in vol. 1) comprehensively explain the published basis for our taxonomic treatments and thus references, making up well over half the over 3 000 references in this volume alone. Thus Vol. 2 is thicker (804 pp. versus 512 in vol. 1) and heavier. 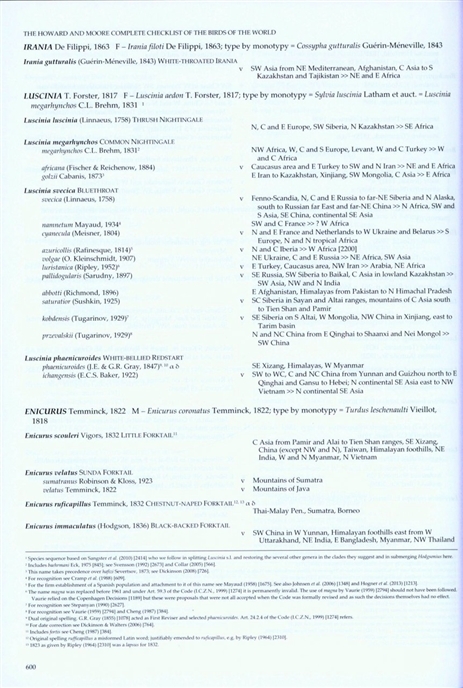 The CD-ROMs in the two volumes differ although the maps are the same in both, some of the appendices are volume-specific, some are updated in Vol. 2. The CD-ROM with Vol. 2 includes the overall treatment of Extinct Birds – replacing the rather perfunctory treatment in Volume 1. 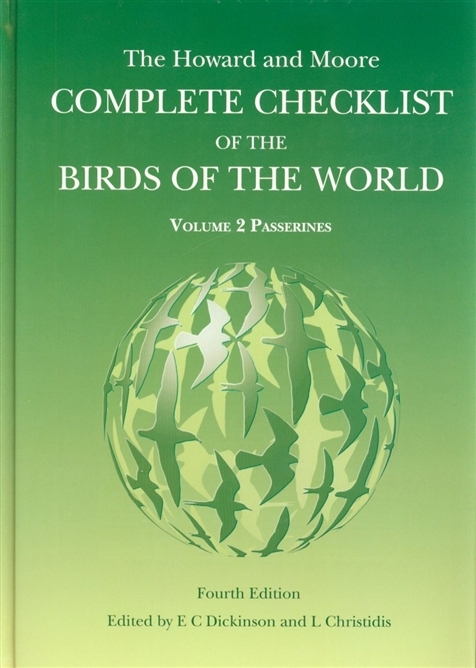 It also includes a Checklist in spreadsheet form, open to revision by the user, covering all the species (and their subspecies groups) in the two volumes: some birders may prefer to record their experience treating some or all of these subspecies groups as the distinct species they seem to be becoming or perhaps already are (which the birds will recognise before we do)."